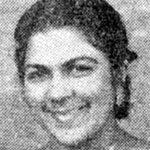 Ayesha Bibi "Asa" Dawood was born in Worcester, Cape Province on the 31 January, 1927 to an Indian Merchant and a Malay woman. As a young girl, Asa (as she was called) used to read the newspaper to her father and from that she started hating the Apartheid Laws, especially the Group Areas Act and the Pass Laws. In 1951, when a call came from a trade union movement to stage a one-day strike, she decided to throw in her weight against the unjust laws. She went to the trade union office and asked to be a volunteer to help organise the strike. The strike was a success. Shortly after the strike, Asa and her friends formed the Worcester United Action Committee and the 24 year-old Asa was elected secretary to the Chairman, John Alwyn. The Committee took up the problems related to pass laws, housing and increasing rentals. During the Defiance campaign, Asa worked closely with the African National Congress (ANC) in calling for volunteers to defy Apartheid laws. By July 1952, Worcester had taken lead in the Western Cape, with about 800 defiers who signed up and Asa's home was the centre of the campaign. Asa then linked up with Ray Alexander, a Food and Canning Worker’s Union leader to try and unionize workers in industries other than food. By 1953, Asa had become a member of the ANC and was sent by Committee of Women, a predecessor of the Federation of South African Women (FEDSAW) to Copenhagen for an International Democratic Federation Conference for Women. During her trip, she visited factories, addressed meetings and went to India to visit her paternal grandmother. It is during her time in India that she met Yusuf Mukadam, who would be her husband. In 1955, Asa and John Alwyn were charged with incitement and arrested for nine months in terms of the Suppression of Communism Act. In 1956, Bibi was arrested and charged with high treason with 155 others; this is where she connected with the most eminent leaders of the oppressed. In 1961 Asa married Yusuf who had followed her back to South Africa from India. Together they had a daughter and then a son. Shortly thereafter, Yusuf was arrested for entering the country illegally and the security police told Asa that her husband would only be able to stay on if she agreed to work for them. She refused and was promptly served with an exit permit that permanently endorsed her out of the country. She left for India in 1968 where she and her family were granted full citizenship and they stayed with Yusuf’s family in the remote village of Sarwa. During her stay in India, Bibi and her family fought hard to return to South Africa. Eventually, her children were issued with South African passports. After fighting for 22 years, Bibi returned to South Africa as one of the thousands of exiles when all political parties were unbanned. She now lives in Worcester.